Specimen Lake no.1 at Cackle Hill Lakes, Biddenden. This is our main lake within the complex. 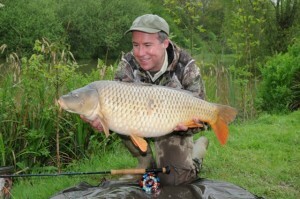 It has nine swims, ensuring that the visiting angler gets a swim packed with features and space. Since digging and extending the car park end, and creating the two islands, the fish-able area of the lake has increased, and with carp over 40lb and catfish doubling that the lake can get very busy. The lake varies in depth from just over 18 inches to seven feet. The lake depths vary throughout the year due to the weather and we are in the process of building some swims to make certain areas more comfortable in the wetter months. Most anglers cast to the far bank but the middle and near side margins should not be ignored and will often produce fish. The cafe end of the lake also has some built up areas topped with gravel and in some areas there are shelves around the islands. We would advise the use of stepped up line and tight clutches as the catfish will easily take you into the snags.